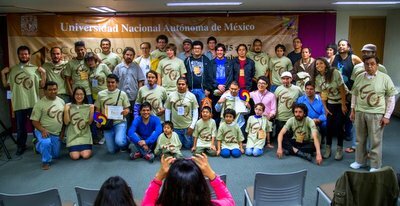 The first-ever Mexican Go Congress was held November 15-17, 2014 at the Tlatelolco Cultural Center in Mexico City, Mexico. 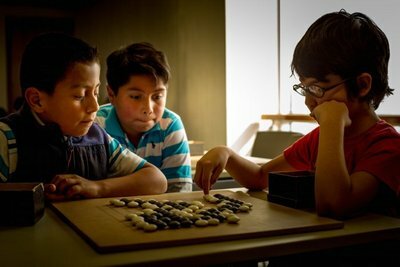 The 3-day Congress hosted several events, including the first Mexican Open Tournament, a 13×13 tournament for kids, and go and origami workshops. Hajin Lee 3P and Kim Sooyong 4P — both sent by the Korean Baduk Association – provided game reviews, lectures and simultaneous game exhibitions. Organized by the Mexican Go Association and sponsored by UNAM, Mexico’s main public university and KABA, the inaugural Congress was a watershed momento not only for the development of go in Mexico, but in Latin America as well. With a 45-player field for the Open Tournament and a total of more than 300 attendees, the event turned out to be a huge success. - reporting by Emil Garcia; click here for a Congress photo album.